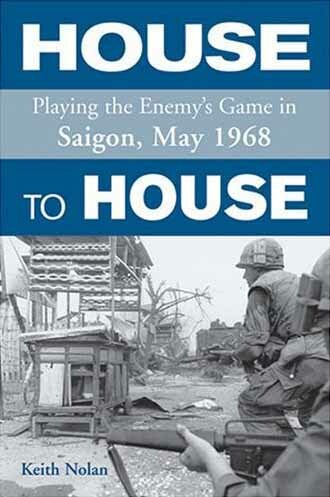 The main focus of ‘House to House’ is the 9th Infantry Division’s efforts to clear the VC from southern Saigon during the so-called Mini-Tet Offensive of May 1968. The defense of Tan Son Nhut Airbase by the 377th Security Police Squadron, USAF, is also described, as is the wounding of General Loan of the Vietnamese National Police, and the deaths of five journalists in the Cholon section of Saigon. For additional information on the fighting in Saigon during Mini-Tet, see ‘Vietnam, Inc.’ by Philip Jones Griffiths,’Dispatches’ by Michael Herr, and ‘After Tet’ by Ronald Spector. REPUBLIC OF VIETNAM, May 1968: The battles of the Tet Offensive were over, and the Paris Peace Talks were about to begin. Yet, the battlefield situation remained tense. Shocked by the intensity and massive scale of the NVA and VC’s Tet Offensive, allied commanders kept waiting for the other shoe to drop in the aftermath of the lunar new year’s nationwide attacks against South Vietnam’s urban centers. Just days before the opening of the peace talks, that other shoe finally dropped. While they had no chance of securing victory on the battlefield with their second wave of urban attacks, the communists expected to wreak substantial psychological damage, making apparent to the American public, if not to the U.S. military high command, the folly of fighting a foe that was seemingly immune to combat losses. The second wave of attacks became known as the Mini-Tet Offensive. The name was a misnomer as far as the intensity of the combat was concerned. Although the communists concentrated on fewer targets than they had during Tet, Mini-Tet was the costliest two-week period of the Vietnam War in terms of American casualties. Saigon was the Mini-Tet’s primary target. In addition to penetrating the Cholon section of the capital, the enemy attacked the capital city’s southern suburbs of District 8. In response, four battalions from the 9th Infantry Division were dispatched from their Mekong Delta battlefields to clear out the invaders. The result was a brutal house-to-house street fight. Tenacious Viet Cong guerrillas dug in like termites, building bunkers inside and between houses, and knocking holes in adjoining walls so snipers could steal unseen from one building to another. There was no provision for retreat; the Viet Cong were on a suicide mission. On the other side were equally tenacious American infantrymen who had to adapt themselves to city fighting after previously operating in the rice paddies of the Delta. The battle for southern Saigon lasted a week, the U.S. Army’s only prolonged urban combat of the entire Vietnam War. The battle ended in a Pyrrhic victory for the soldiers of the 9th Infantry Division. They had fought with raw courage, earning numerous decorations, including four Distinguished Service Crosses, in the course of pushing the Viet Cong out of District 8. However, in fighting that eerily foreshadows American combat in Iraqi cities, the engaged battalions destroyed the neighborhoods they liberated. This destruction, and the attendant civilian casualties, resulted in an official investigation of the 9th Infantry Division for its sledgehammer application of artillery and air strikes within the capital of South Vietnam.